This is “Managing Project Quality”, chapter 10 from the book Beginning Project Management (v. 1.1). For details on it (including licensing), click here. Project managers have two different interests in quality. Some projects are performed to provide a significant improvement in the quality of an existing process, and the project activities themselves must reflect high-quality standards. A basic knowledge of the statistics and procedures used in quality control will help the project manager understand the objectives of step projects and perform projects in companies that are committed to high-quality standards. QualityDegree to which a set of inherent characteristics fulfill requirements. is a relative term, which means that something is of high or low quality compared to what it is required to be. According to the International Organization for Standardization (ISO), quality is “the degree to which a set of inherent characteristics fulfill requirements.”International Organization for Standardization, Quality Management Systems—Fundamentals and Vocabulary (Geneva: ISO Press, 2005), in Project Management Institute, Inc., A Guide to the Project Management Body of Knowledge (PMBOK Guide), 4th ed. (Newtown Square, PA: Project Management Institute, Inc., 2008), 190. The requirements of a product or process can be categorized or given a gradeCategory of product or service requirements.. The quality is determined by how well something meets the requirements of its grade. Consider the following examples. Determining how well products meet grade requirements is done by taking measurements and then interpreting those measurements. StatisticsMathematical interpretation of numerical data.—the mathematical interpretation of numerical data—is useful when interpreting large numbers of measurements and is used to determine how well the product meets a specification when the same product is made repeatedly. Measurements made on samples of the product must be between control limitsUpper and lower extremes of allowable variation.—the upper and lower extremes of allowable variation—and it is up to management to design a process that will consistently produce products between those limits. 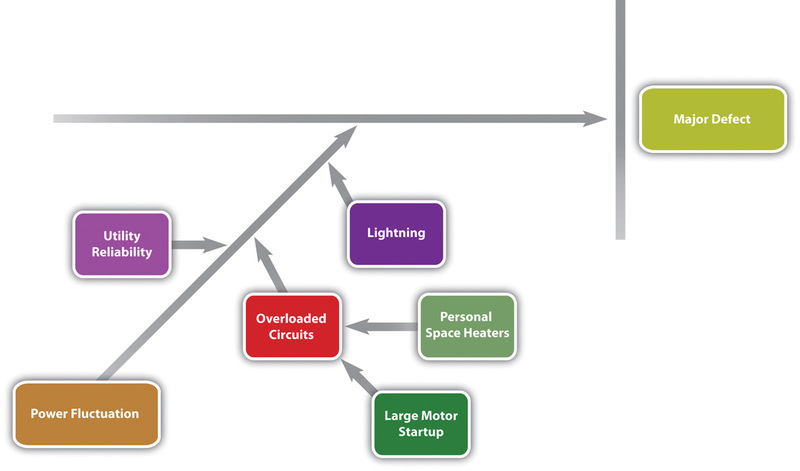 If a process is designed to produce a product of a certain size or other measured characteristic, it is impossible to control all the small factors that can cause the product to differ slightly from the desired measurement. Some of these factors will produce products that have measurements that are larger than desired and some will have the opposite effect. If several random factors are affecting the process, they tend to offset each other most of the time, and the most common results are near the middle of the range. This idea is called the central limit theoremIdea that if variation is caused by several random factors, they will generally cancel each other out and most measurements will be near the middle of the range of variation.. If the range of possible measurement values is divided equally into subdivisions called binsEqual size ranges into which measurements are sorted to obtain a frequency distribution., the measurements can be sorted, and the number of measurements that fall into each bin can be counted. 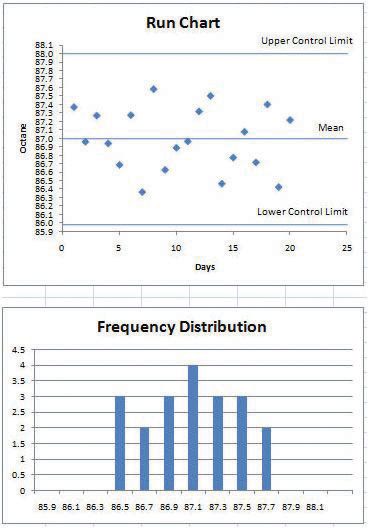 The result is a frequency distributionThe number of measurements that fall into defined bins. that shows how many measurements fall into each bin. If the effects that are causing the differences are random and tend to offset each other, the frequency distribution is called a normal distributionFrequency distribution that looks like a bell and is the result of offsetting random variations., which resembles the shape of a bell with edges that flare out. The edges of a theoretical normal distribution curve get very close to zero but do not reach zero. A refinery’s quality control manager measures many samples of 87 octane gasoline, sorts the measurements by their octane rating into bins that are 0.1 octane wide, and then counts the number of measurements in each bin. 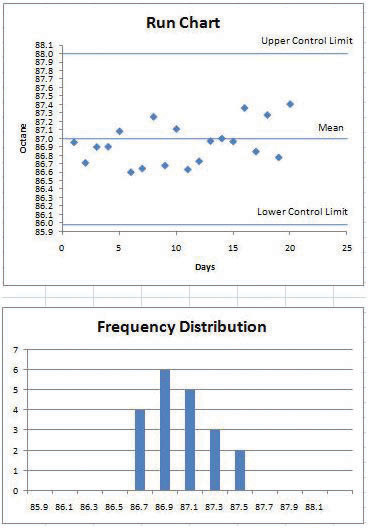 Then she creates a frequency distribution chart of the data, as shown in Figure 10.1 "Normal Distribution of Measurements of Gasoline Samples". 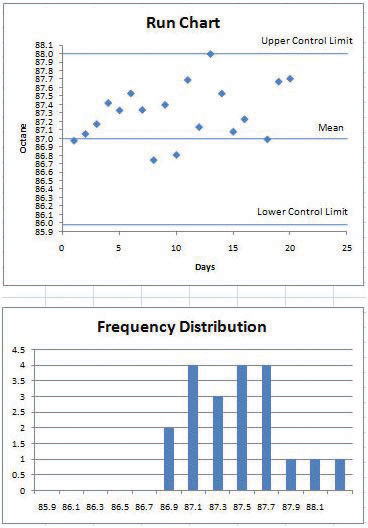 If the measurements of product samples are distributed equally above and below the center of the distribution as they are in Figure 10.1 "Normal Distribution of Measurements of Gasoline Samples", the average of those measurements is also the center value that is called the meanAverage found by summing the values and dividing by the number of values. and is represented in formulas by the lowercase Greek letter µ (pronounced mu). The amount of difference of the measurements from the central value is called the sample standard deviation or just the standard deviationA type of average that takes into account positive and negative values where a sample is used instead of all the measurements. 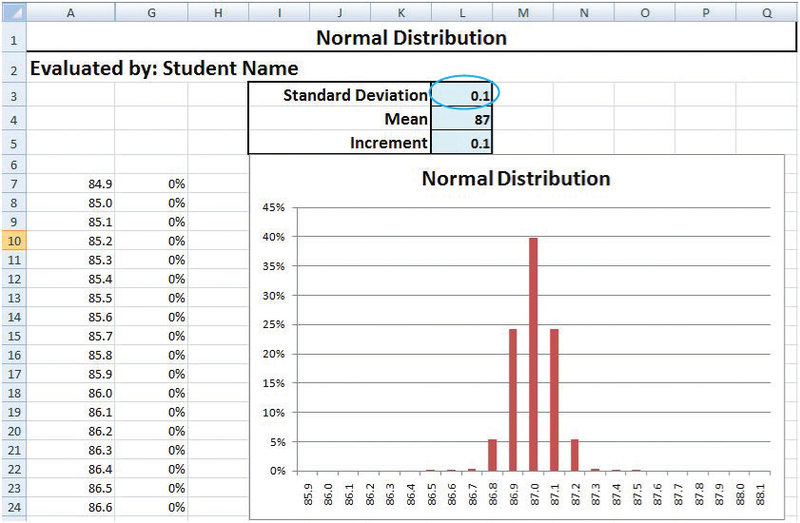 To calculate the standard deviation, first the difference between each value and the mean is squared. The squared values are summed and divided by the number of values minus one. 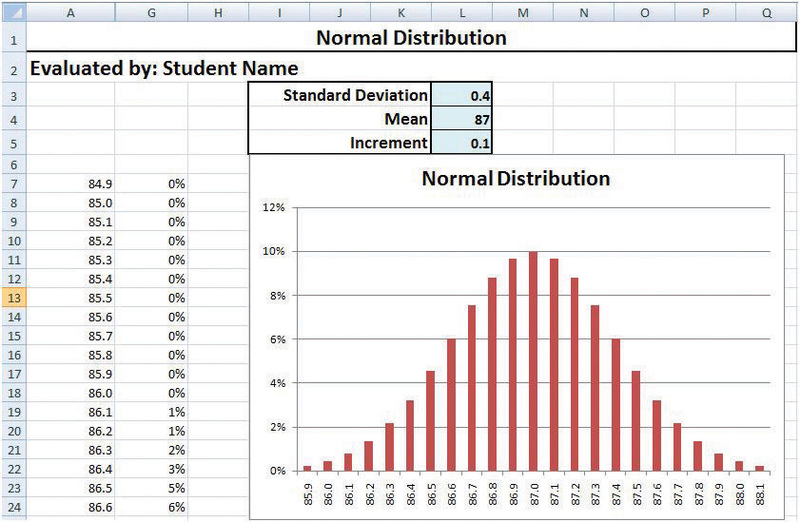 The square root of this value is the standard deviation, also known as the Sample Standard Deviation.. The first step in calculating the standard deviation is subtracting each measurement from the central value and then squaring that difference. (Recall from your mathematics courses that squaring a number is multiplying it by itself and that the result is always positive.) The next step is to sum these squared values and divide by the number of values minus one. The last step is to take the square root. The result can be thought of as an average difference. (If you had used the usual method of taking an average, the positive and negative numbers would have summed to zero.) Mathematicians represent the standard deviation with the lowercase Greek letter σ (pronounced sigma). If all the elements of a group are measured, it is called the standard deviation of the population and the second step does not use a minus one. For normal distributions, about 68.3 percent of the measurements fall within one standard deviation on either side of the mean. This is a useful rule of thumb for analyzing some types of data. If the variation between measurements is caused by random factors that result in a normal distribution and someone tells you the mean and the standard deviation, you know that a little over two-thirds of the measurements are within a standard deviation on either side of the mean. Because of the shape of the curve, the number of measurements within two standard deviations is 95.4 percent, and the number of measurements within three standard deviations is 99.7 percent. For example, if someone said the average (mean) height for adult men in the United States is 5 feet 10 inches (70 inches) and the standard deviation is about 3 inches, you would know that 68 percent of the men in the United States are between five feet seven inches (67 inches) and six feet one inch (73 inches) in height. You would also know that about 95 percent of the adult men in the United States were between five feet four inches and six feet four inches tall, and that almost all of them (99.7 percent) are between five feet one inches and six feet seven inches tall. These figures are referred to as the 68-95-99.7 ruleApproximate percentages of measurements that are within one, two, and three standard deviations of the mean.. Some products must have less variability than others to meet their purpose. For example, if one machine drills a hole and another machine shapes a rod that will slide through the hole, it might be very important to be sure that if the smallest hole was ever matched with the widest rod, that the rod would still fit. Three standard deviations from the control limits might be fine for some products but not for others. In general, if the mean is six standard deviations from both control limits, the likelihood of a part exceeding the control limits from random variation is practically zero (2 in 1,000,000,000). Refer to Figure 10.4 "Meaning of Sigma Levels". Describe the historical events and forces that led up to today’s emphasis on quality as a competitive requirement. Describe quality awards in Japan and the United States. Describe quality programs and standards such as TQM, Six Sigma, and ISO 9000. Describe and calculate the cost of quality. Quality management is an approach to work that has become increasingly important as global cooperation and competition have increased. A review of the history of quality management explains why it is so important to companies and why clients often require projects to document their processes to satisfy quality standards. Prior to the late 1700s, products such as firearms and clocks were made as individual works where the parts were adjusted to each other so they could work together. If a part broke, a new one had to be made by hand to fit. In 1790 in France, Honoré Blanc demonstrated that he could make musket parts so nearly identical that a musket could be assembled from bins of parts chosen at random.Ken Alder, “Innovation and Amnesia: Engineering Rationality and the Fate of Interchangeable Parts Manufacturing in France,” Technology and Culture 38, no 2 (April 1997): 273–311. The practice of making parts to a high level of accuracy in their dimensions and finishes made the parts interchangeable. The use of interchangeable parts became the founding principle of assembly line manufacturing to produce all manner of goods from sewing machines to automobiles. The manufacturers of firearms and weapons were often the leaders in improving quality because reliable and safe operation of weapons and their rapid repair is a matter of life and death. During World War II, factories were converted from manufacturing consumer goods to weapons. War plants had to make large numbers of parts as fast as possible while doing it safely for the workers and for the service members who used them. Important improvements in quality control (QC)Management of production standards through statistical interpretation of random product measurements.—the management of production standards through statistical interpretation of random product measurements, which emphasizes consistency and accuracy—were made during this period. A key figure in the history of quality management who was an important person in the war effort was Walter Shewhart at Bell Telephone Laboratories. Shewhart recognized that real processes seldom behaved like theoretical random distributions and tended to change with time. He separated causes of variation into two categories: chance causeVariation due to random events. and assignable causeVariations that can be attributed to a particular event or influence.. Chance causes could be ignored if they did not cause too much variation, and trying to eliminate them often made the problem worse, but assignable causes could be fixed. To help distinguish between variations caused by random events and trends that indicated assignable causes, Shewhart introduced the control chartScatter chart with time on the horizontal axis and measurement scale on the vertical axis. It also displays the mean and control limits. It may mark two standard deviations from the mean., which is also known as a type of run chartChart of measurements that shows variations as the process progresses in time. because data are collected while the process is running. 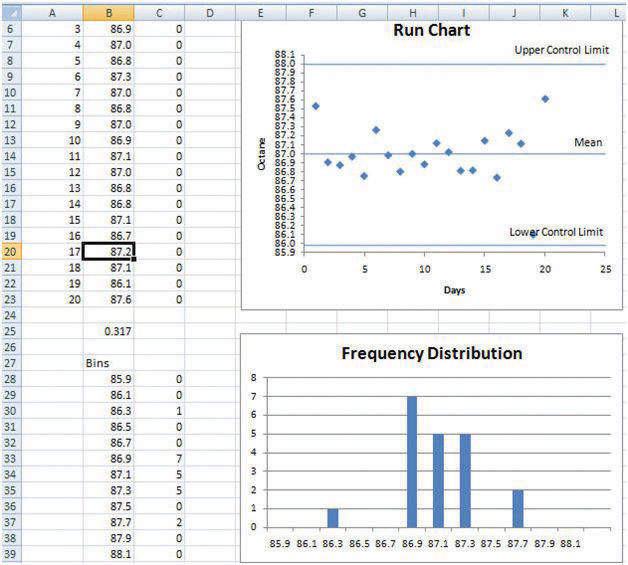 A control chart has time on the bottom axis and a plot of sample measurements. The mean, upper control limit, lower control limit, and warning lines that are two sigma from the mean are indicated by horizontal lines. 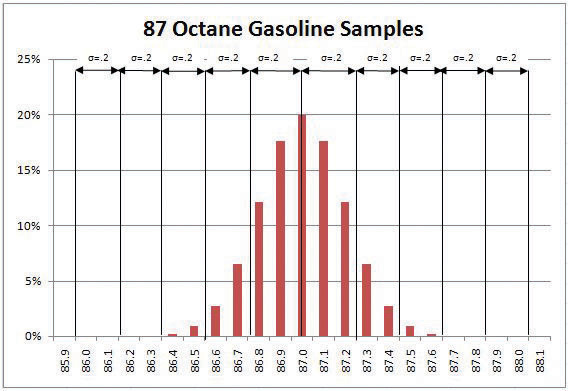 The refinery quality control manager takes samples each day of the 87 octane gasoline for twenty days and charts the data on a control chart, as shown below. She recognizes that the highest and lowest measurements are not part of a trend and are probably due to chance causes. However, the control chart from the next twenty days, as shown below, indicates an upward trend that might be due to an assignable cause. She alerts the process manager to let him know that there is a problem that needs to be fixed before the product exceeds the upper control limit. This might indicate the need to initiate a project to fix the problem. The most influential person in modern quality control was an American who was a hero in Japan but virtually unknown in the United States. W. Edwards Deming worked with Shewhart at Bell Labs and helped apply Shewhart’s ideas to American manufacturing processes during World War II. Following the war, American factories returned to the production of consumer goods. Many of the other major manufacturing centers in the world had been damaged by bombing during the war and took time to recover. Without the safety needs of wartime and with little competition, quality control was not a high priority for American companies.John Dowd, “How the Japanese Learned to Compete,” Asia Times, October 27, 2006, http://www.atimes.com/atimes/Japan/HJ27Dh01.html (accessed August 11, 2009). Management in the United States focused on increasing production to meet demand and lowering costs to increase profits. After the war, while the United States occupied Japan, Deming was asked by the U.S. Department of the Army to assist with the statistics of the 1950 census in Japan. Kenichi Koyanagi, the managing director of the Union of Japanese Scientists and Engineers and a very influential industrialist, asked Deming to speak to twenty-one top industrial leaders on the topic of global strategy for Japanese industry. Deming went beyond Shewhart’s work and talked about his philosophy of quality manufacturing and how the responsibility for quality begins with management. He explained that a corporate culture devoted to producing high-quality products would result in less waste, lower costs, greater client loyalty, and greater market share. With Koyanagi’s support, Deming’s ideas were widely adopted by these influential leaders. In 1950, the Japanese created the Deming prizeAward for quality in Japan named after W. Edwards Deming, an American. in Deming’s honor, which is awarded to an individual and a company for major advances in quality improvements. In 1960, Deming was awarded the Order of the Sacred Treasure, Second Class by the Prime Minister on behalf of Emperor Hirohito. By the 1970s, Japanese companies had a reputation for high quality and were taking market share from American companies, but Deming’s teachings were virtually unknown in his own country. It was not until 1980 that America became aware of Deming when his work was described in an NBC documentary titled If Japan Can, Why Can’t We?John Dowd, “How the Japanese Learned to Compete,” Asia Times, October 27, 2006, http://www.atimes.com/atimes/Japan/HJ27Dh01.html (accessed August 11, 2009). By then, Deming was eighty years old and the producer of the show originally assumed he was dead.Thomas J. Boardman, “The Statistician Who Changed the World: W. Edwards Deming, 1900–1993,” The American Statistician 48 (August 1994): 179–87. Create constancy of purpose toward improvement of product and service. Adopt a new philosophy. We are in a new economic age. Western management must awaken to the challenge, learn their responsibilities, and take on leadership for a change. End the practice of awarding business on the basis of price tag. Instead, minimize cost. Move toward a single supplier for any one item, on a long-term relationship of loyalty and trust. Improve constantly and forever the system of production and service to improve quality and productivity and thus constantly decrease costs. Eliminate slogans, exhortations, and targets for the workforce asking for zero defects and new levels of productivity. Between 1979 and 1982, Ford Motor Company lost $3 billion, and they were looking for solutions to their problems. They chose to apply Deming’s approach to develop the new Taurus-Sable model and by 1986 had become the most profitable American auto company.Gabor, A. (2001, June 13). Quality revival, Part 2: Ford embraces Six Sigma. New York Times (Late Edition (east Coast)), p. C.5. Retrieved October 24, 2010, from ProQuest National Newspapers Core. (Document ID: 74042886). KaizenJapanese term for involvement of all members of the group (see total quality management).. Improvement must involve all members of a company.Encyclopedia Britannica, s.v. “Total Quality Control,” http://www.britannica.com/EBchecked/topic/1387304/Total-Quality-Control (accessed August 13, 2009). Atarimae hinshitsuJapanese concept of making things work as they are intended to work (See total quality management).. Make things work the way they are supposed to work.NationMaster.com, “Miryokuteki Hinshitsu,” 2005, http://www.statemaster.com/encyclopedia/Miryokuteki-Hinshitsu (accessed August 14, 2009). KanseiJapanese concept of learning from the way a user applies the product in order to improve it (see total quality management).. Learn from the way a user applies the product to make improvements.WASEDA University, “Kansei Quality” (accessed June 20, 2010). Miryokuteki hinshitsuJapanese concept that things should have an aesthetic quality and be pleasing to use (see total quality management).. Things should have an aesthetic quality and be pleasing to use.NationMaster.com, “Miryokuteki Hinshitsu,” 2005, http://www.statemaster.com/encyclopedia/Miryokuteki-Hinshitsu (accessed August 14, 2009). The Deming approach represents one philosophy that is used in its entirety or not at all. In contrast, TQM can be tailored to a particular environment. Both agree that a long-term commitment is required by top management. However, Deming would drop clients if they started to wane, while TQM consultants were less demanding. Deming insists on constancy of purpose, while TQM adapts to the situation, which results in lack of constancy. Deming requires adoption of his principles of profound knowledge, while TQM lacks this unified philosophy. Many poorly qualified consulting firms provided training in TQM to American companies. The approach worked in some cases but not in others where it was applied superficially, and the movement’s credibility was diminished. Another approach to quality management in the United States was formulated at Motorola in 1986 and was named Six Sigma (6σ)Quality management system that give titles to specialists and requires a cost-benefit analysis.. The Six Sigma practices were based on Deming’s work, TQM, and others and had similarities regarding continuous efforts at improvement involving everyone at the company. It emphasized a clear focus on achieving quantifiable financial returns from any Six Sigma project. To determine the financial return on a quality initiative, the cost of quality (COQ)Total cost of efforts to improve quality plus the cost of failure. must be determined. The cost of quality has two parts: the cost of prevention and the cost of failure (or nonconformance). The cost of quality is the sum of the cost of prevention and the cost of failure. If spending more on prevention reduces the cost of failure by an even greater amount, the total cost of quality is reduced. Trade between countries increased as countries recovered from WWII and began producing consumer goods. In 1948, the General Agreement on Tariffs and Trade (GATT) established the rules for international trade in the postwar world. Through years of negotiations based on GATT, the World Trade Organization (WTO)Negotiating forum for improving trade relationships between countries. was created in 1995. The WTO is a negotiating forum where governments can discuss ways to help trade flow as freely as possible.World Trade Organization, “Understanding the WTO: Basics,” http://www.wto.org/english/thewto_e/whatis_e/tif_e/fact1_e.htm (accessed August 14, 2009). ISO 9000. Fundamentals and vocabulary for this group of quality standards. ISO 9004. Ways to extend benefits of ISO 9001 to employees, owners, suppliers, partners, and society in general. It is a guide for top management for overall quality improvement. ISO 9011. Guidance for auditing a quality system. Identify key processes and the interactions needed to meet quality objectives. Implement and manage the QMS and its processes. Build your ISO 9001-based QMS. Implement the system, train company staff, and verify effective operation of your processes. Manage your QMS—focus on client satisfaction, strive for continual improvement. If necessary, seek third-party certification and registration of the QMS, or alternatively, issue a self-declaration of conformity.International Organization for Standardization, Quality Management Systems—Fundamentals and Vocabulary (Geneva: ISO Press, 2005), in Project Management Institute, Inc., A Guide to the Project Management Body of Knowledge (PMBOK Guide), 4th ed. (Newtown Square, PA: Project Management Institute, Inc., 2008). The need for production of safe, reliable weapons that could be mass produced led to use of methods to assure that parts were manufactured within controlled limits. An early example is the interchangeable musket parts produced in France in 1790 and, later, the quality control methods introduced by Shewhart in the United States during World War II. Following World War II, Japanese companies followed advice from Deming and others to make quality a top priority for management. Higher-quality products gave Japan a competitive advantage with U.S. consumers that forced U.S. firms to respond with similar quality programs. The Deming award is given by Japan to companies doing business in Japan for high-quality standards. Similarly, the Baldrige National Quality Award is given to U.S. companies and individuals for their contribution to quality. Total quality management is a flexible program that is adapted from Japanese practices that emphasize kaizen, participation by all; atarimaie hinshitsu, making things work the way they should; kansei, learning from the way the client uses the product to make improvements; and miryokuteki hinshitsu, giving products an aesthetic quality to make them pleasing to use. Six Sigma identifies specialists within the organization and assigns titles like Master Black Belt. Each quality project must evaluate the cost of quality to gain approval. The International Standards Institute devises guidelines for establishing practices. The ISO 9000 group are guidelines for establishing practices that are likely to create quality products. The cost of quality has two parts: the cost of prevention and the cost of failure. The cost of prevention includes costs to establish quality practices and the costs to verify them. The cost of failure includes internal costs before the product is sold, such as waste and fixing products, while external costs include those that occur after the product is sold, such as returns and lawsuits. Quality control is very important in the manufacturing of _______ because the safe and reliable operation of those products is a matter of life and death. The prize for quality in Japan is named after _________ (last name). The quality program created at Motorola and adopted by Jack Welch at General Electric is __________. The cost of quality considers the cost of prevention and the cost of ___________. What is the purpose of having an international quality standard like ISO? If a quality program costs $10,000 to plan and $50,000 to administer, what is the COQ if the program reduces waste by $30,000 and returns of bad products by $40,000? Explain how you calculated the answer. Describe a project activity where the cost of prevention might be much higher than the cost of failure and unlikely enough to accept the risk of its failure rather than pay the cost of prevention. Similarly, describe a project activity where the cost of prevention is smaller than the cost of failure. Project quality refers to two distinct aspects of the project. Project quality can refer to the quality of the product or service delivered by the project. Does the end product meet client specifications? For example, does a software development project develop a program that performs to the client’s requirements? A software program that performs the basic work functions but does not integrate with existing software would not be considered a quality product, as long as the client specified that the software must interface with existing software. Project quality can also refer to managing the project efficiently and effectively. Almost any client specification can be met if the project manager has unlimited time and resources. Recall that high quality means meeting the requirements for a particular grade while providing value. Meeting project deliverables within the time and resource constraints is also a measure of project quality. Developing a project execution plan that matches the complexity level of the project is the most critical aspect in developing a project plan that meets project specifications within the time frame and at the lowest costs. These two aspects of project quality have similarities and differences to quality as applied to parent organizations. All successful quality programs have (1) a requirement for commitment to quality by all the employees and their partners and (2) an emphasis on error prevention and client satisfaction. To comply with TQM, Six Sigma, ISO, or other quality standards required by the client or by the project management firm, the project manager must engage in quality programs and provide documents that specifically comply with the quality standards in use. For example, a project is typically required to follow the parent organization’s work processes related to procurement and document management. Any project processes that interface with the organization’s quality processes will be required to meet the quality standards of the organization. At a midwestern university, a new building was being built, but it was over budget. To reduce the cost of the energy management system and avoid a late penalty, the project manager installed a cheaper energy management system. The less expensive system could not reduce power to the air circulation fans during peak electrical price periods, and it was not compatible with other campus systems. Five years after the building was built, when a central control unit was installed to coordinate building energy consumption, the incompatible system was replaced because it could not communicate with the central campus energy control system or save as much in electrical costs. The university did not take the time to specify the quality of the building control system in the scope statement and was not aware of the implication of the substitution at the time it was made. As a result, the cost of quality was lower in the prevention category but much higher in the cost of failure category. Because the parties acted in their own interests instead of the interest of the total university and quality was not a team effort, waste occurred and total cost increased. At a remote mining site in South America, the gasoline and diesel fuel must be brought in by truck over poorly maintained roads to run the trucks and heavy equipment used to set up an ore processing facility. The vendor for supplying fuel is required to provide fuel in the right grades for the various vehicles, in the appropriate quantities, and in a timely manner. If fuel of the right type and grade, with acceptable levels of impurities, is delivered a week after the vehicles have run out of fuel, the work on the fuel-delivery activity is of low quality. 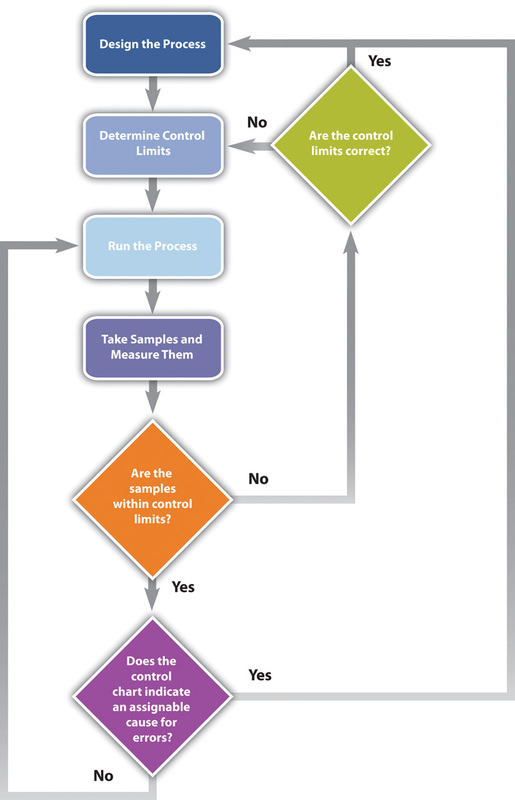 How is quality control of a project different from quality control of a manufacturing process? Consider a project you have been involved in, in which the cost of prevention would be part of the project budget but the cost of failure would be incurred after the project was completed. Describe why you think top management would have to be involved to make the best decision for the company.